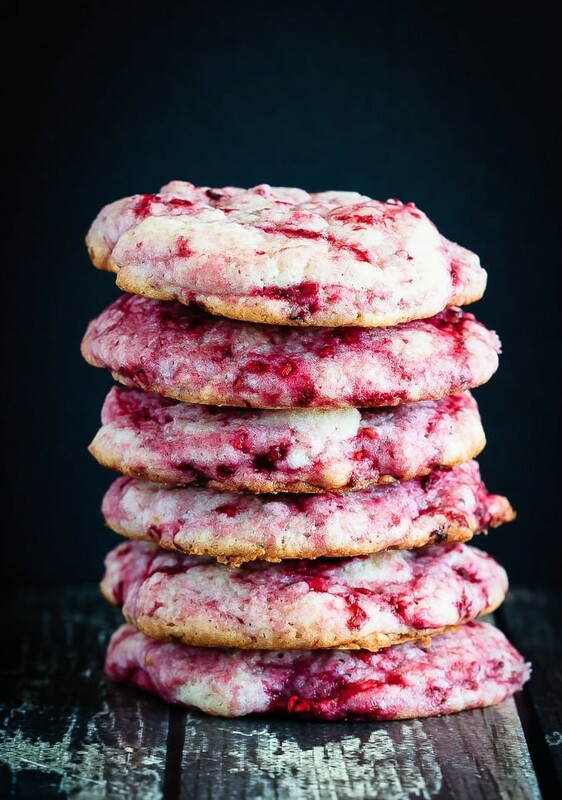 These raspberry lemon cookies are ultra soft and chewy - quick and easy to make and so tasty everyone loves them. One of the best cookies I've made! Raspberry lemon is one of the few combos that doesn’t involve chocolate that I absolutely adore. These Lemon Raspberry Sweet are probably one of my favourite breakfast indulgences ever – and it’s because of the raspberry lemon combo. Just so, so good. Preheat the oven to 350 degrees F. Line 2 cookie sheets with parchment paper or silicone baking mats. Set aside. In a large bowl, or the bowl of a stand mixer, cream together the butter and sugar until light and fluffy. Add the vanilla, egg, lemon zest and juice and mix well, scraping down the sides of the bowl as needed. Add the salt, baking powder, baking soda and flour and mix until combined. Add in the raspberries and mix briefly to incorporate them. Drop the dough by tablespoonful (a cookie scoop works best here, the dough is extremely sticky, but two spoons works too, the cookies will just be less uniform) onto the prepared cookie sheet. Bake for 14-16 minutes or until they are just starting to brown on the edges and are no longer shiny at all. Put the second half of the cookie dough in the fridge while the first sheet is baking, it will get even softer as the raspberries thaw. Allow the cookies to cool on the baking sheet for 10 minutes before moving to a wire rack to cool completely. Store in an airtight container at room temperature for 5 days, or freeze for up to 3 months. This cookie dough is extremely sticky, and is best if the raspberries stay frozen, so leave them in the freezer until you’re ready to add them to the dough. If you find it is getting too sticky to scoop, chill it for 30 minutes and then bake. Don’t try to form it into balls by hand though, it works best as a drop cookie, scooping it onto the baking sheet by the tablespoonful and baking immediately. When baking, they are done when they are no longer shiny at all on top. If they are still shiny, they will be underbaked around the raspberries. ALMOND JOY COOKIES – JUST 4 INGREDIENTS!